There is greater need now in the world of fashion to redefine sustainability and to bring solutions that are relevant to the issues that the global fashion industry is facing. The Responsible Fashion Movement was set up in 2017 to do just that. It first defined the current need by identifying eight impact areas that could be the base from where the solutions will flow. These impact areas will be the pillars of development or movement. One of the key objectives defined was that ‘knowledge’ will be converted into ‘action’. So that through the action the solutions are visible. 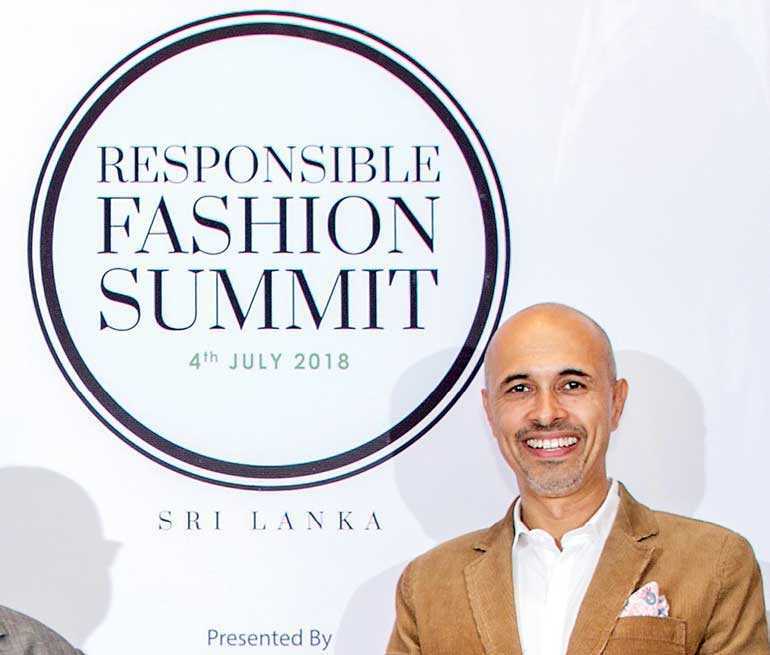 The Summit will take place on 4 July at Shangri-la Hotel Colombo at Lotus Ballroom at 9 a.m.
To make the solutions visible a high level knowledge sharing platform was required and this became the birthplace for the Responsible Fashion Summit. This was the thought leadership arm of the movement. The first Responsible Fashion Summit was launched in March 2018. The focus of the first summit broadly was the societal impact and the environmental impact, with a theme ‘A New Normal’. This was the step the industry wanted to take in Sri Lanka and show it as the shining light in region by leading this inclusive movement for the bigger good of the environment. “This is a defining movement for Sri Lanka, Asia and rest of the world, as our mandate for impact is unique and is very relevant to the global issues that the fashion supply chain is facing, and Sri Lanka is perfectly placed to take the lead in the region,” says Ajai Vir Singh, Founder of The Responsible Fashion Movement. After the successful first summit, the second Responsible Fashion Summit was framed to push the environmental causes strongly. This themed of the second summit ‘Earth Sensitive’. The focus shifts to bring awareness and solutions to environmental issues that the global fashion industry is facing. An annual progress or report card is being developed to track the annual progress on each pillars. The moderator for the summit is Mihirini de Zoysa; she is the managing director of Corporate Druids, among other things, a specialist in Organisation Development Consulting. The summit will include nine sessions, covering topics such as – the Designer Panel to present Unburdening Earth; Speakers will be David Abraham (India) Sharleen Ernster (USA) Jeremy Sommers (Australia) and Heidi Gosman (UK). The role of media, how it influences consumer behaviour towards Responsible Fashion will be presented by Nonita Kalra, Editor in Chief Harpers Bazaar India. A Manufacturer Panel: Can Responsible Fashion be part of the business plan will be presented by MAS Holdings and Hirdaramani Group; followed by an innovative sustainable fabric presentations by Eco Spindle (Sri Lanka) and Smart Fibres (Germany). Also Launch of Earth Conscious Cooperative will be presented by Collaborative platform. The final session will be the Denim Hackathon final results driven by Hirdaramani Group.The above agenda reflects the eight pillars and is part of a five-year growth plan that aims to include key stakeholders in the region and across the world. The board of advisors of the Responsible Fashion Movement include Ajay Amalean, Sharleen Ernster, Dr. Anush Amarasinghe, Bibi Russell, Sarinda Unamboowe, Nikhil Hirdaramani. The executive committee is Sharika Senanayake, Fazeena Rajabdeen and Shamilka Samarasinha. Ajai Vir Singh is the Founder of The Responsible Fashion Movement. The Responsible Fashion Movement is endorsed by The Commonwealth Fashion Council (CFC), London. Daniel Hatton, Director and CEO of the CFC is in Colombo to speak at the forum. Responsible Fashion Summit is presented by MAS Holdings, hosted at Shangri-La Hotel, Colombo, in association with Hirdaramani Group, Beira Group, BMW i3 and The Design Development Corporation.